We found the Mid Century modern sofa on craigslist for only $100 (!) and had the cushions reupholstered in a vintage-y nubby orange fabric by Victor at House of a Thousand Fabrics in nearby Atwater Village. 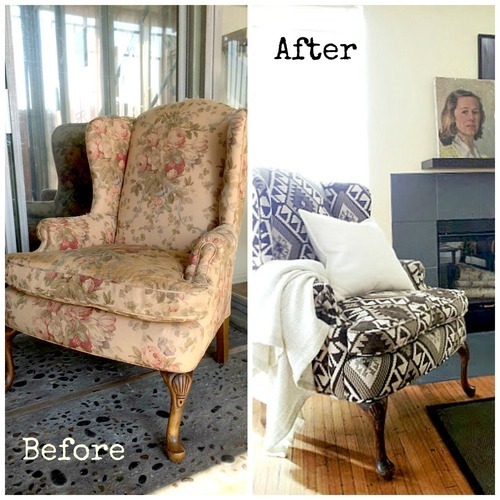 The Navajo fabric wingchair was also a “rescue mission.” The sad floral chair was found on the street and given a new life. 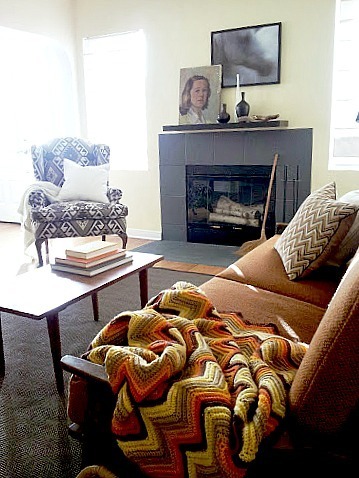 We love the Navajo fabric, sourced at Mood in LA. 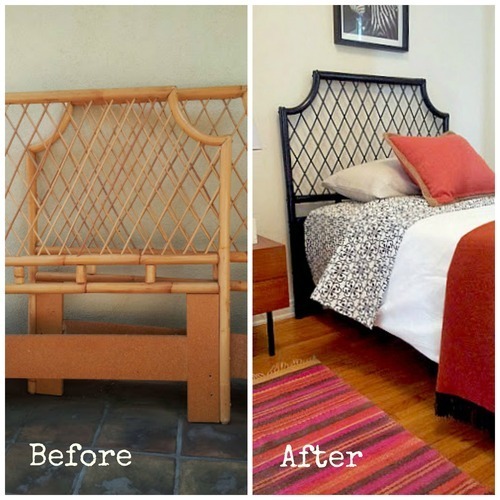 The faux bamboo headboard came from a fab vintage store in LA’s Garvanza district. We bought a set of two, painted one black and we’re using the other one as-is in another staging — but will paint it black sooon. Can’t wait to put these babies together in a room with a nightstand and lamp between them! 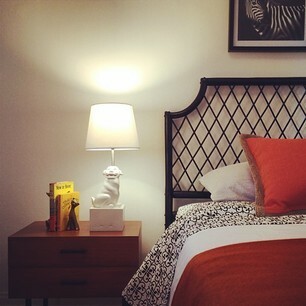 We put one of our vintage peacock chairs in the master bedroom, pairing it with a small vintage side table. 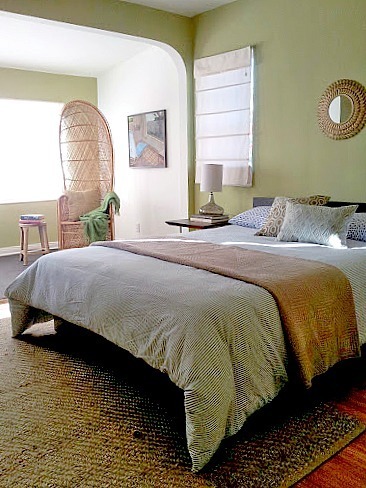 In the Echo Park house, we went with a more upscale look — a little less funky and a lot more elegant. 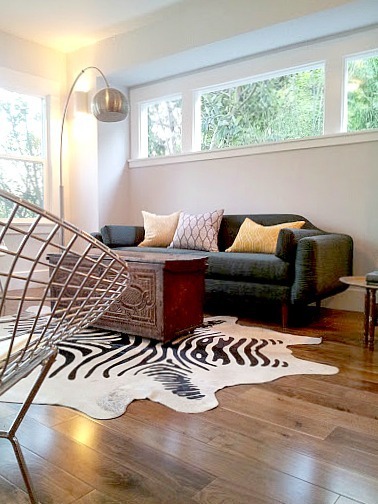 The arc lamp was a prize we won in a Lamps Plus giveaway :) And the zebra print cowhide rug was found on craigslist. The cocktail table and Moroccan tray table are antiques. In the detached studio space, an Airbnb just waiting to happen. 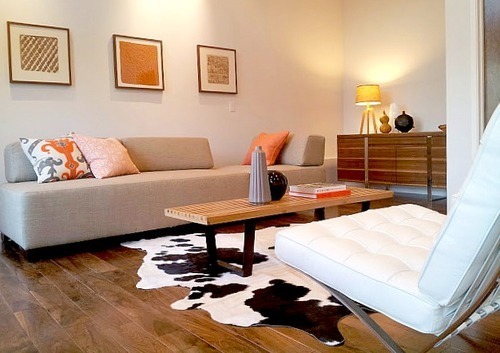 We used modular sectional sofa pieces to create just the right configuration and added a Nelson bench repro, “Barce-clona” chairs in crisp white leather, a modern credenza and a graphic cowhide rug underneath it all. Framed textured paper from Swain’s Art Supplies in Glendale adds to the gallery vibe.